Despite Storm Diana trying her best to deter folk, there was a great turnout at the Golden Lion Hotel in Stirling for the latest Be Reasonable Scotland Roadshow – a big thank you to everyone who braved the elements! 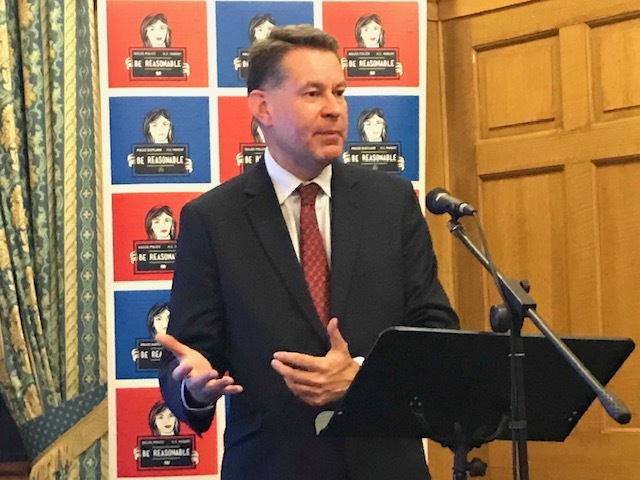 We were delighted to have Murdo Fraser MSP as our main speaker for the evening. He explained the three reasons why he is opposed to John Finnie’s Bill to criminalise parents who smack their children. First of all, laws should only be passed if there is a social ill that needs to be addressed. But there is no evidence at all that mild reasonable chastisement has negative effects on children. Indeed, when he asked former Early Years Minister Mark McDonald last year if he was aware of any such evidence, he said he was not. The evidence from New Zealand shows that more harm than good has resulted from their smacking ban. And thirdly, he said that the decision on whether to smack children should be left to parents, not the State. He recalled how unpopular the Scottish Government’s Named Person scheme has been because it represents an undue interference in family life. Mr Fraser added that the argument that children should be as “equally protected” as adults – because we wouldn’t hit an adult – is ridiculous. You wouldn’t ‘ground’ your grandmother, put her on the naughty step or limit her screentime! No – we treat children differently from adults in lots of ways. This Bill is unpopular, unworkable and unenforceable. He finished by urging those present to respond to the call for evidence from the public, which Holyrood’s Equality and Human Rights Committee has made. This runs until Friday 25th January. The Christian Institute’s Nigel Kenny then explained how people could do that and went through a number of further arguments. He also played a Be Reasonable Scotland campaign video, which you can watch here. And explained various ways in which those present could help the campaign. There was a very lively and extended Q&A at the end, during which there was a common theme of opposition to state intrusion into family life. Murdo stressed how important it was for people to contact their MSPs to make their concerns known – so that they will know how serious a matter it is for their constituents. The next Be Reasonable Scotland Roadshow will take place in Aberdeen on Thursday 6th December at 7.30pm. Venue: Skene House, 96 Rosemount Viaduct. If you live in the area, we hope to see you there!